As of Monday, it appeared that Brett Kavanaugh would become the newest Supreme Court Justice. However, following a recent series of allegations accusing Mr. Kavanaugh of attempted sexual assault as well as inappropriate and aggressive sexual behavior, his nomination has been called into question. The partisan divide is more clear than ever with Republicans dismissing these claims as a midnight hour smear campaign. While Mr. Kavanaugh will face no criminal charges in the matter(s), it calls into question the level of proof required to believe an accusation. There is no hard definition on that level of proof, except for in the court systems. Therefore, who should you protect when there is no guideline for the level of proof required? Do you protect the accuser or do you protect the accused? Higher education has always been a microcosm of the political discourse happening on the national stage. Following the recent #MeToo Movement as well as the controversy surrounding the allegations of Mr. Kavanaugh, it is likely that there will be reform in campus sexual assault procedures soon. Campus sexual assault procedures have attempted to solve the disparity between protecting the accuser or protecting the accused. As of right now, to be found guilty, one must be found guilty ‘beyond a preponderance of the evidence’, meaning it is more likely than not that the accused committed the offense. However, with the partisan divide growing more boisterous, the amount of proof required and the protections for each individual may change drastically. 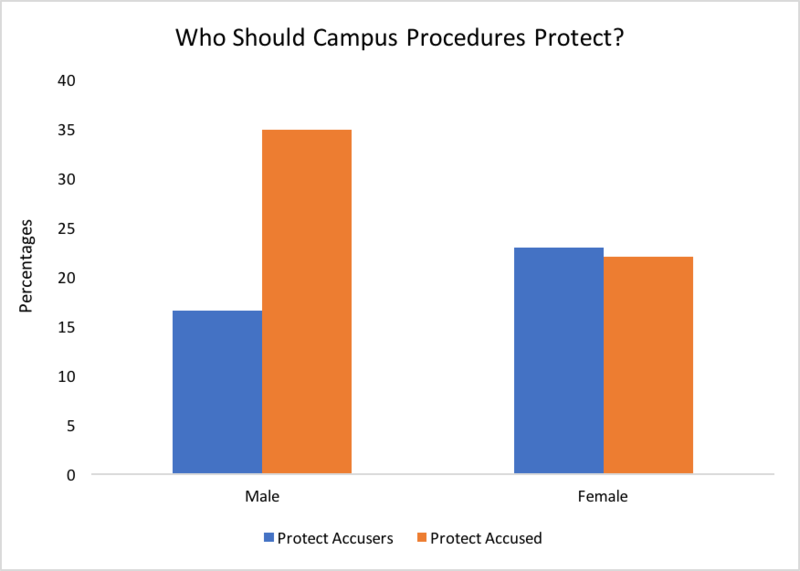 In a nationally representative survey, the Bucknell Institute of Public Policy asked individuals should campus procedures protect the accuser or the accused more? 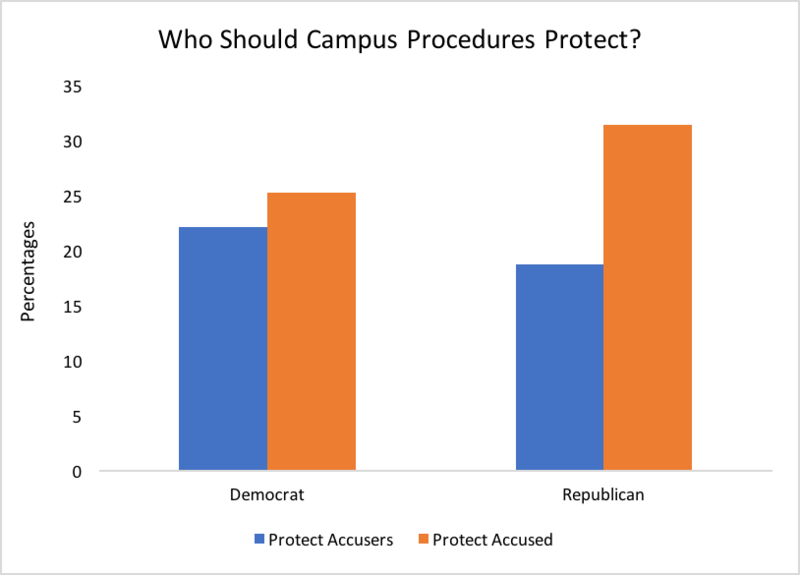 By first examining partisanship, the survey showed that 22% of Democrats and 19% of Republicans believed campus procedures should favor protecting the accusers. Amongst Democrats there was only a slight difference with 25% of Democrats believing that campus procedures should favor protecting the accused. Republicans, on the other hand, shot up to 31% in favor of protecting the accused. The Bucknell Institute of Public Policy was also interested to see if there would be a gender breakdown in regards to who should be protected during sexual assault proceedings. Overall, the survey showed that 17% of men and 23% of women favored protecting the accuser during procedures while 35% of men and 22% of women favored protecting the accused. What does this mean for campus sexual assault proceedings? In this political climate, it can swing either way. Some advocate for policies that parallel that of the criminal court system whereas others advocate for strict protections for the accusers so that sexually violent acts are not underreported. Overall, Brett Kavanaugh’s appointment or rejection will certainly have implications on whether or not procedures ascribe more importance and protections to those who accuse or to those who are accused. Higher education and its sexual assault procedures will be the first to feel the results of this controversial nomination.